Just like our previous SF&O book, this features a bunch of profiles and short stories, this time focused on Superman. The stories all take place (and the first one possibly written) before they doubled-down on the dumb and gave us the blue and red Electric Supermen so outside of the profiles it’s only Electric Superman Blue that shows up. I wonder what Superman’s favorite color is? I’m thinking green. What about you? I should note that it says “Secret Files And Origins” on the cover but just “Secret Files” in the indicia. I kind of like the full version on the cover. There are various writers and artists involved, but I’ll only list the ones I’ll be going over. I will say that all the art is fair to good. The Kents are visited by Clark’s college roommate, Gordon Selkirk, but the conversation ends up about the man he’s been studying, Superman, and why he is the way he is. Gordon tries to learn this without revealing he knows Clark is Superman because he isn’t Gordon. He’s Batman, trying to figure out why Superman is the way he is and why they’re so different. He comes to realize it was the love of the Kents and the life of growing up how he did, while Bruce lost his parents at an early age. It’s a neat way of going over Superman’s history to this point. Jurgens excels at stories that showcase why Superman is the hero of hope and compassion that he is and this is one of the good ones, although Batman’s obsession to figure this out this many years after having known him seems odd. Also, while he doesn’t have those dumb shoulder spikes his cape is way too long. I could see him or someone else tripping over the darn thing. Writer Karl Kesel treats this as a transcript of Jimmy recording some thoughts for his autobiography while on the run from Intergang. It goes into his life in the post-Crisis DCU, how and why he got on the Daily Planet staff, and his current standing. It’s a good framing device for the one-page prose story. He also penned one of the two “lost pages”, a fun short about Flash, Green Lantern, Wonder Woman, Guardian, Martian Manhunter, Captain Marvel, and Robin protecting Metropolis while Superman was on his honeymoon…I mean “secret mission”. Captain Marvel and Robin don’t really do anything. The other “lost page” is what Clark and Lois were doing. It’s funny but if you think about it lazy. It’s just the door for a bunch of panels on one page with the tray of food showing up and the lighting changing. Writer and penciler Stuart Immonen took the easy route for him and inker José Marzan, Jr., but it is rare to see a story where the hero goes on vacation and there isn’t trouble. I hope they didn’t go anywhere special though. The only reason you should spend an entire week in your hotel room in someplace like Honolulu is if you live there. There is also a tour of the Fortress and a little more history. It didn’t really do a lot for me either. I didn’t really have time to go over the sections made up like the Daily Planet or DCU gossip rag National Whisper. There are also the profile pages, and I really like the one on Superman (that reinforces why those of us who like Superman do so) and one on Clark Kent that explains how the disguise works, and as has been noted many times here at the Spotlight IT ISN’T JUST THE STUPID GLASSES! It notes just how the disguise works, which was also chronicled in this NerdSync video (which I could have sworn I posted to the Spotlight but I can’t find it) I think everyone should watch before passing judgement on the disguise. Overall this is a good time capsule of the period but for Superman as a whole it’s rather outdated by today’s post-Flashpoint DCU and only worth it if you want a time capsule of Superman during his electric blue period. 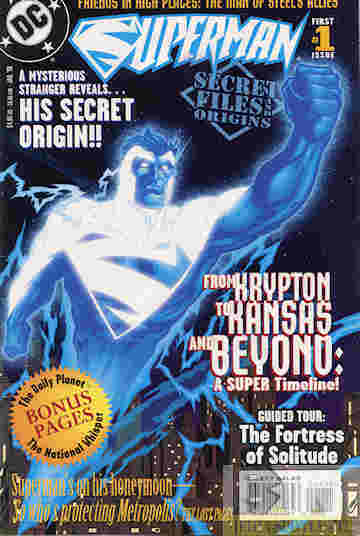 Posted by ShadowWing Tronix on August 23, 2018 in DC Spotlight, Yesterday's Comics and tagged DC Comics, DC Universe, Scanning My Collection, Secret Files, Secret Files & Origins, Superman.